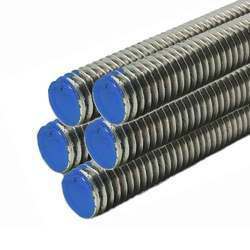 Offering you a complete choice of products which include welding rod and ss threaded rod. Enlisted amongst one of the dependable business names, we have been involved in presenting a wide range of Welding Rod. Welding Rod is in arc welding an Rod is used to conduct current through a work piece to fuse two pieces together. Depending upon the process, the Rod is either consumable, in the case of gas metal arc welding or shielded metal arc welding, or non-consumable, such as in gas tungsten arc welding. For a direct current system the weld rod or stick may be a cathode for a filling type weld or an anode for other welding processes. For an alternating current arc welder the welding Rod would not be considered an anode or cathode. An Rod is a metal wire that is coated. It is made out of materials with a similar composition to the metal being welded. There are a variety of factors that go into choosing the right Rod for each project.